6 WHAT’S IN THE DEMO KIT? See details below and click for FAQ. Do you have a big wish list? Did you know that you can join Stampin Up just for a discount? Kit can combine: Everything in my online store. Be a part of our Stamp It demonstrator group including Facebook community, VIP site and more. More details on joining are below. 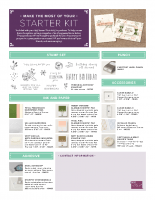 You’ll also receive a business supplies pack (valued at $50 and includes a case of NEW Stampin’ Up Catalogs) to create a kit with a total value of $175 that still ships for FREE! WHAT’S IN THE DEMO KIT? Want some help picking out the products for your kit? Check out these suggestions. Access to my Stamp It group with my Exclusive videos and tutorials, as well as my Facebook demo group community filled with fun and so much more.